Dr. H.O. 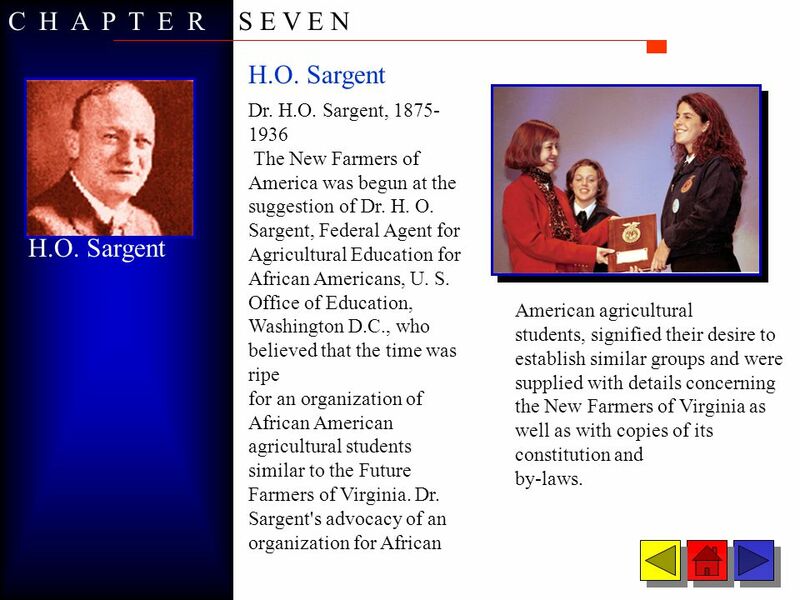 Sargent, The New Farmers of America was begun at the suggestion of Dr. H. O. Sargent, Federal Agent for Agricultural Education for African Americans, U. S. Office of Education, Washington D.C., who believed that the time was ripe for an organization of African American agricultural students similar to the Future Farmers of Virginia. Dr. Sargent's advocacy of an organization for African H.O. Sargent American agricultural students, signified their desire to establish similar groups and were supplied with details concerning the New Farmers of Virginia as well as with copies of its constitution and by-laws. 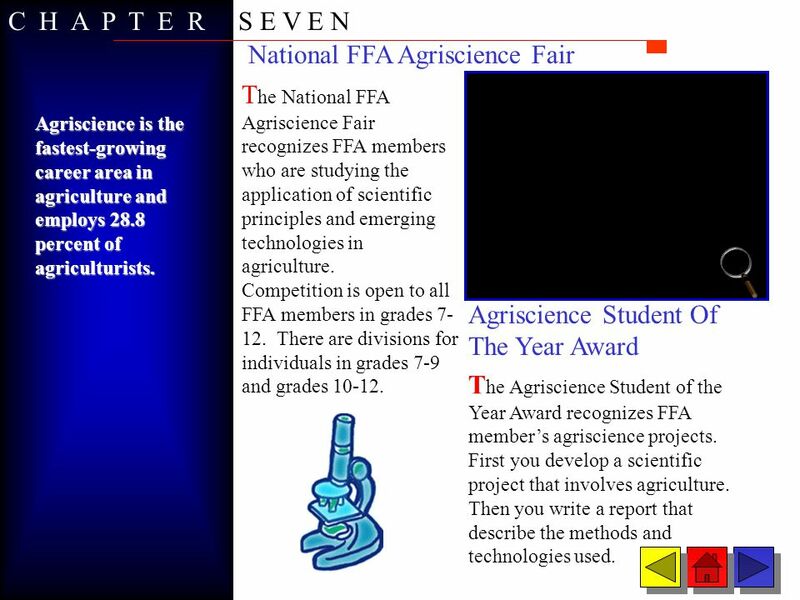 C H A P T E R S E V E N National FFA Agriscience Fair The National FFA Agriscience Fair recognizes FFA members who are studying the application of scientific principles and emerging technologies in agriculture. 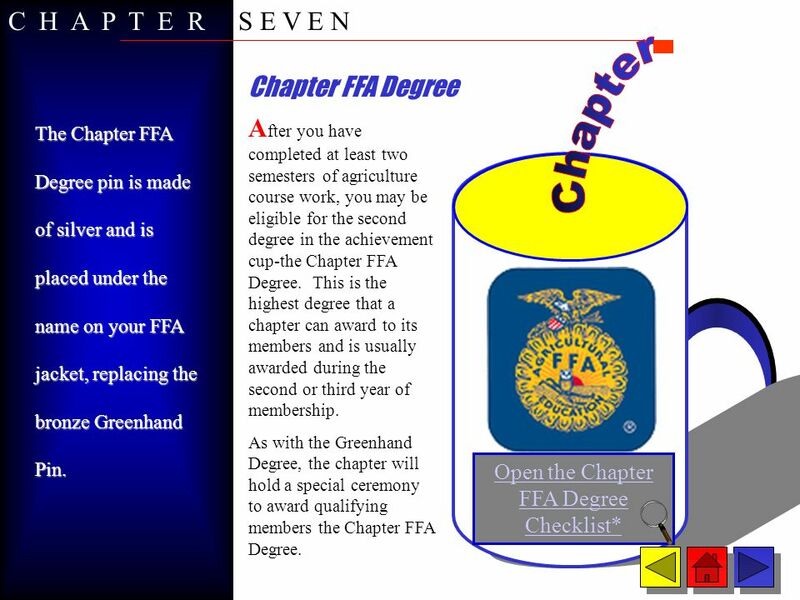 Competition is open to all FFA members in grades There are divisions for individuals in grades 7-9 and grades Agriscience is the fastest-growing career area in agriculture and employs 28.8 percent of agriculturists. Agriscience Student Of The Year Award The Agriscience Student of the Year Award recognizes FFA member’s agriscience projects. First you develop a scientific project that involves agriculture. Then you write a report that describe the methods and technologies used. Each year the National FFA Organization awards more than 1 million in scholarships to members. 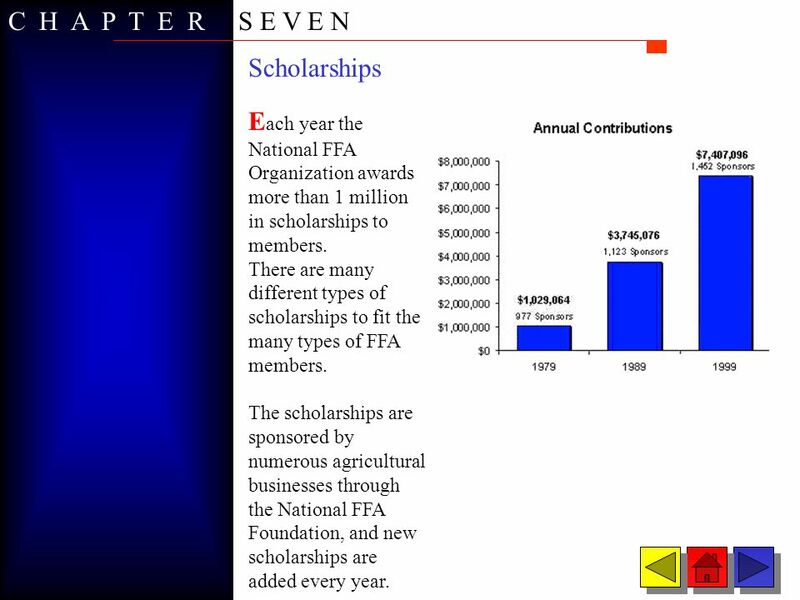 There are many different types of scholarships to fit the many types of FFA members. The scholarships are sponsored by numerous agricultural businesses through the National FFA Foundation, and new scholarships are added every year. 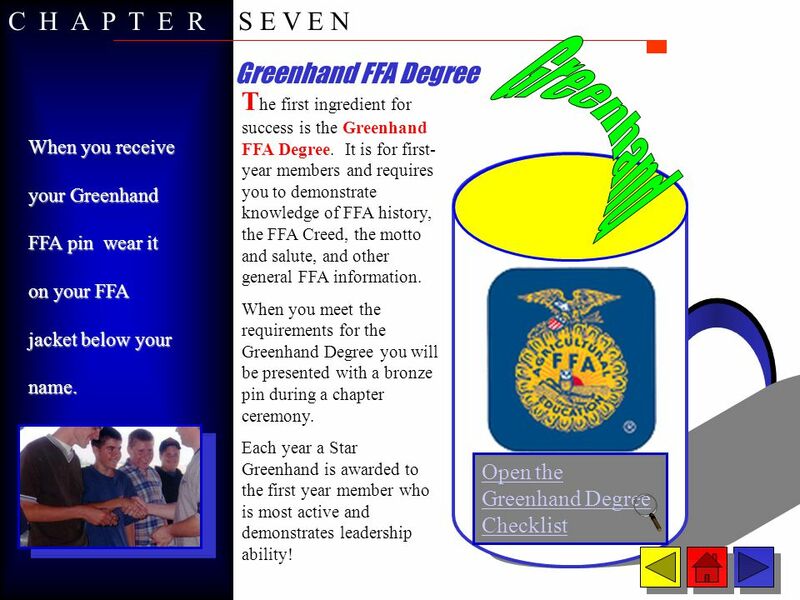 12 C H A P T E R S E V E N FFA offers many different awards and activities that you can choose from. Whether your specialty is agriscience, horticulture, marketing, farm and ranch management, public speaking, or raising livestock, you can win awards at the local, state, and national levels. These award programs give you the opportunity to apply what you have learned in the classroom. By participating in the activities, you’ll meet new friends, face new challenges in competitive events, and become eligible for more awards than you can imagine. 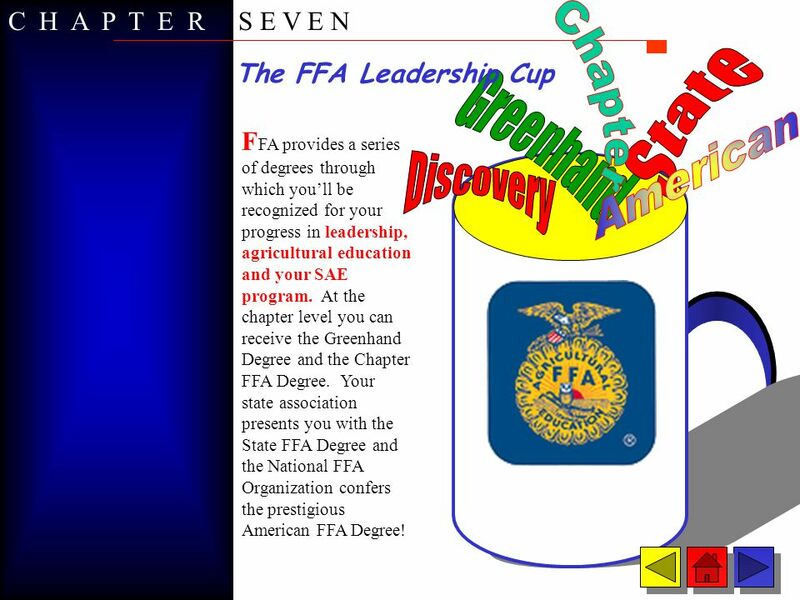 13 C H A P T E R S E V E N Proficiency Awards The Proficiency Awards Program is based on your SAE program and is the most diverse award program FFA offers. 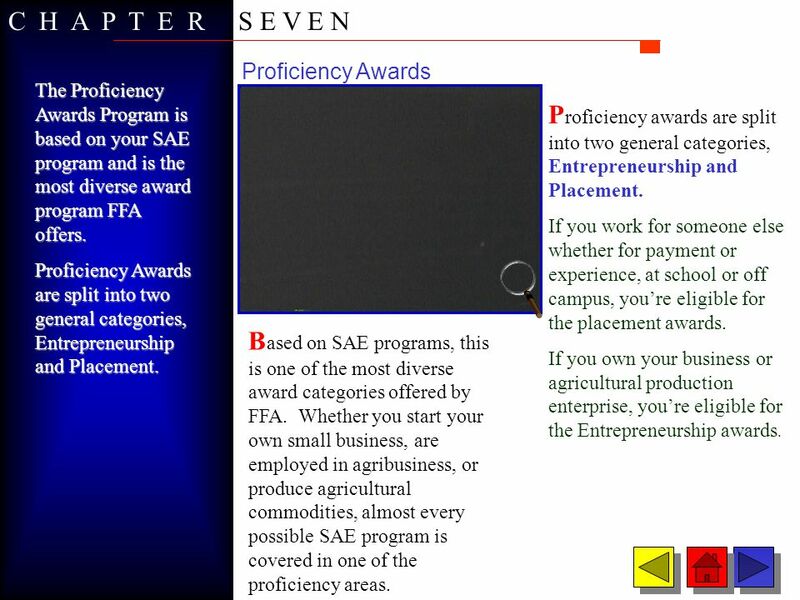 Proficiency Awards are split into two general categories, Entrepreneurship and Placement. Proficiency awards are split into two general categories, Entrepreneurship and Placement. If you work for someone else whether for payment or experience, at school or off campus, you’re eligible for the placement awards. 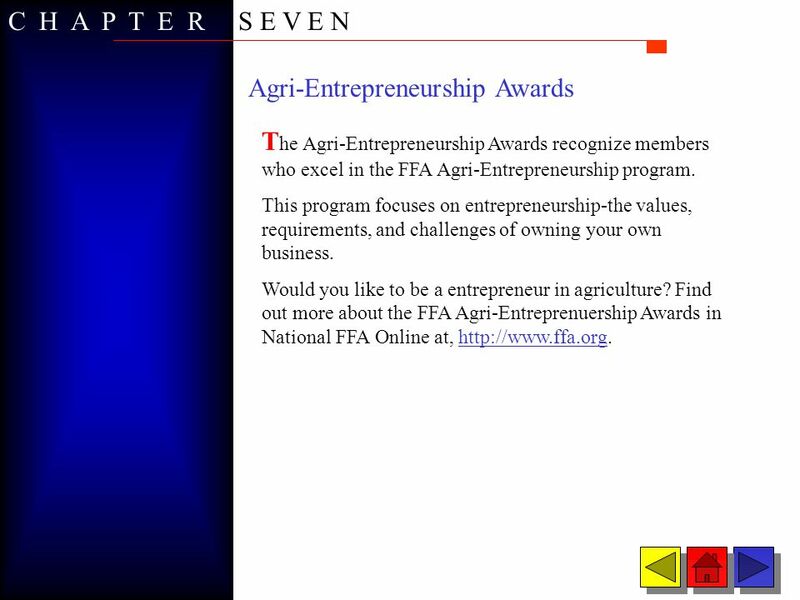 If you own your business or agricultural production enterprise, you’re eligible for the Entrepreneurship awards. 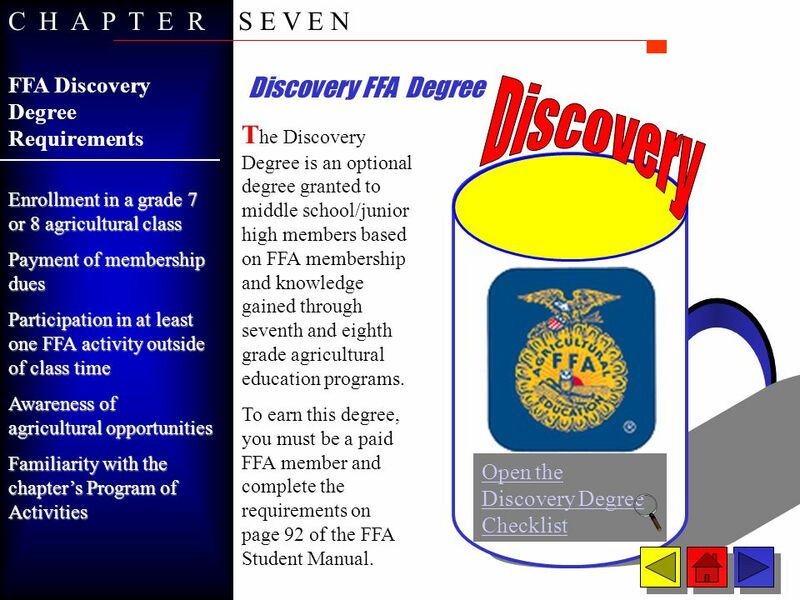 Based on SAE programs, this is one of the most diverse award categories offered by FFA. Whether you start your own small business, are employed in agribusiness, or produce agricultural commodities, almost every possible SAE program is covered in one of the proficiency areas. 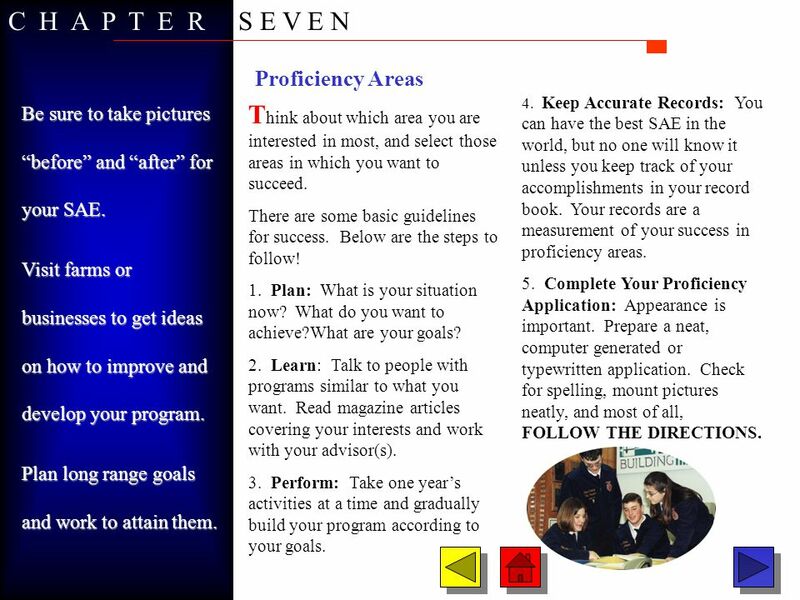 16 C H A P T E R S E V E N Proficiency Areas Be sure to take pictures “before” and “after” for your SAE. Visit farms or businesses to get ideas on how to improve and develop your program. Plan long range goals and work to attain them. 4. Keep Accurate Records: You can have the best SAE in the world, but no one will know it unless you keep track of your accomplishments in your record book. Your records are a measurement of your success in proficiency areas. 5. Complete Your Proficiency Application: Appearance is important. Prepare a neat, computer generated or typewritten application. Check for spelling, mount pictures neatly, and most of all, FOLLOW THE DIRECTIONS. Think about which area you are interested in most, and select those areas in which you want to succeed. There are some basic guidelines for success. Below are the steps to follow! 1. Plan: What is your situation now? What do you want to achieve?What are your goals? 2. Learn: Talk to people with programs similar to what you want. Read magazine articles covering your interests and work with your advisor(s). 3. Perform: Take one year’s activities at a time and gradually build your program according to your goals. 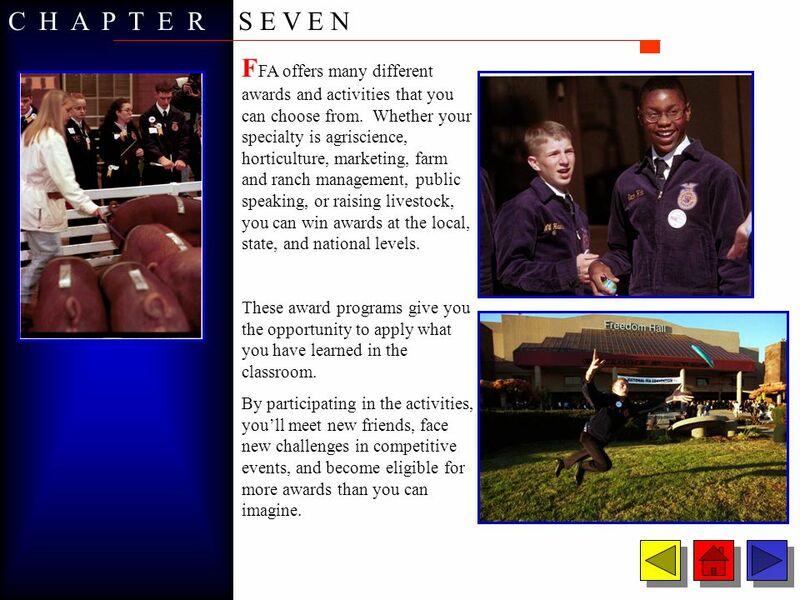 Download ppt "7 CHAPTER Member Opportunities and Awards Chapter Overview"
FFA… The rest of the story.. Supervised Agriculture Experience SAE Project in the FFA –Major Internship Entrepreneurship Research –Minor Exploratory Supplementary. 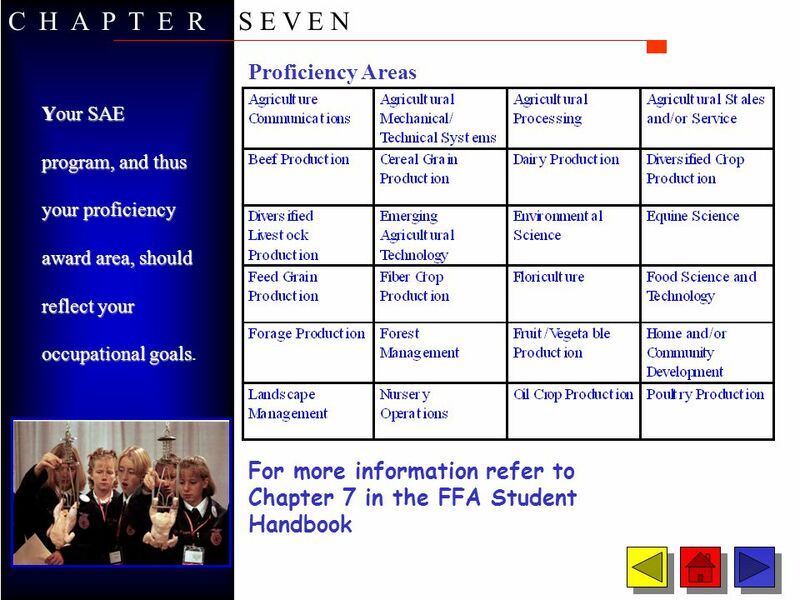 FFA Jeopardy! Waterford Union High School. Rules Each team sends one person per turn. They cannot get help from their team First to buzz in gets 15 seconds. What in the World is SAE ?. SAE Info SAE stands for Supervised Agricultural Experience SAE is your major project for this class. It counts for 30% of. SAEP Mr. Ham. Objectives  Define supervised Agricultural Experience Program  List examples of projects students may have as SAEP  Explain the purpose. 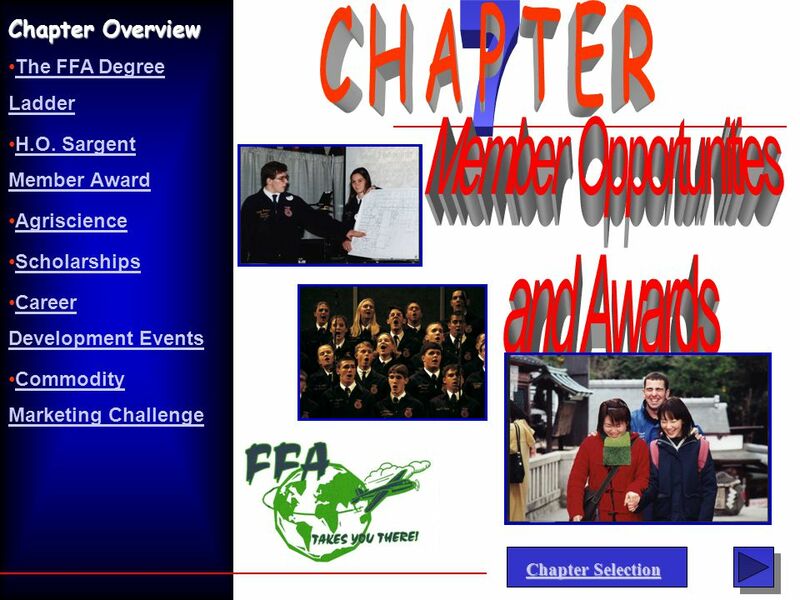 Chapter Selection Chapter Selection Agricultural Careers and Supervised Agricultural Experience Programs (SAEs) Chapter Overview Supervised Agriculture. 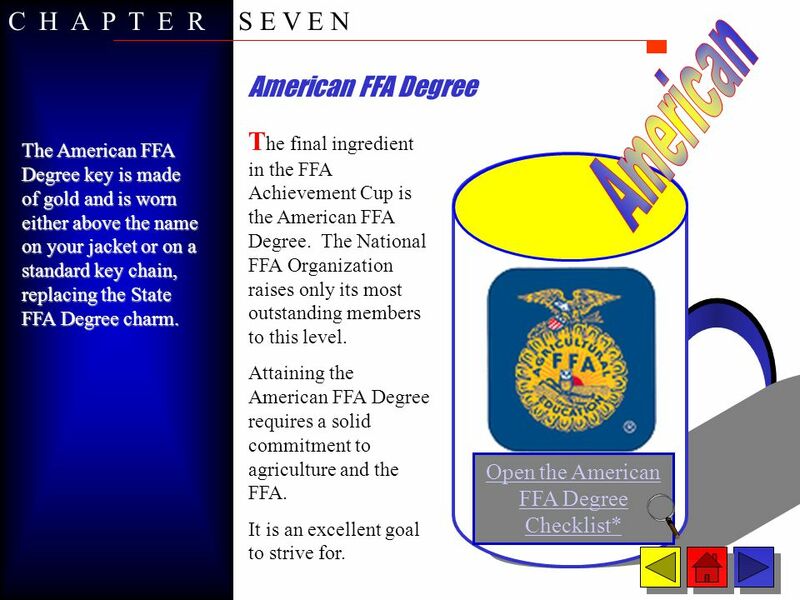 FFA Degrees & Membership By Rick sokol & Ed meisel Sec.# 0004. 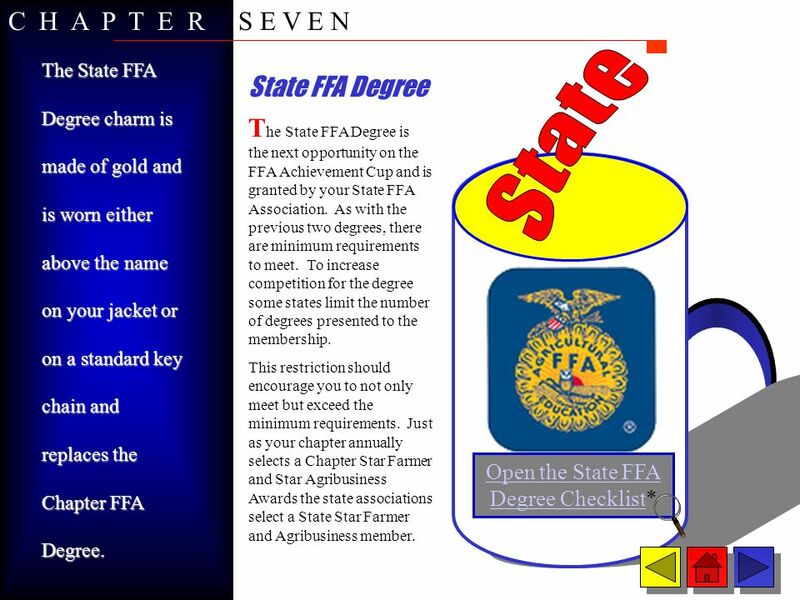 Today’s FFA The Official Manual Guides the formation of each chapter’s activities As well as state associations and the national organization. 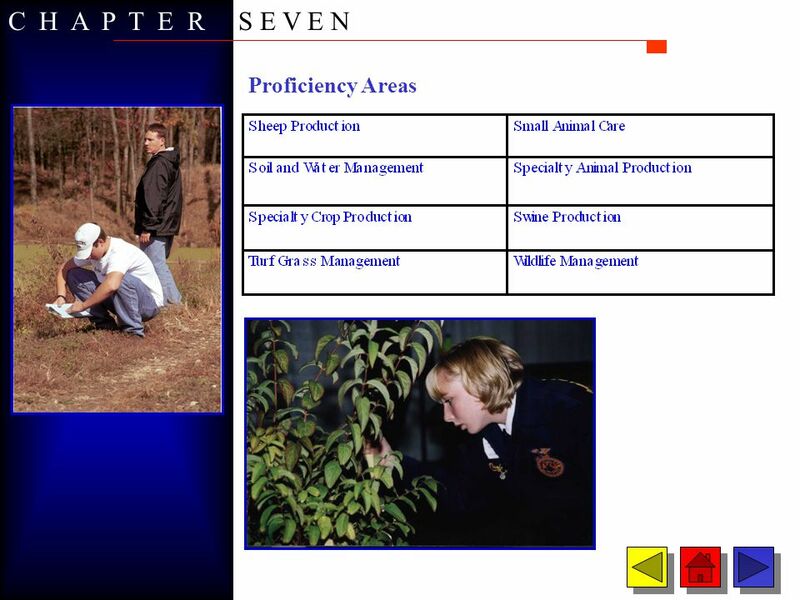 SAE Selection AFNR-BAS-3 Explore, develop, and implement the Supervised Agricultural Experience (SAE) program by researching careers in agriculture and. S upervised A gricultural E xperience A. 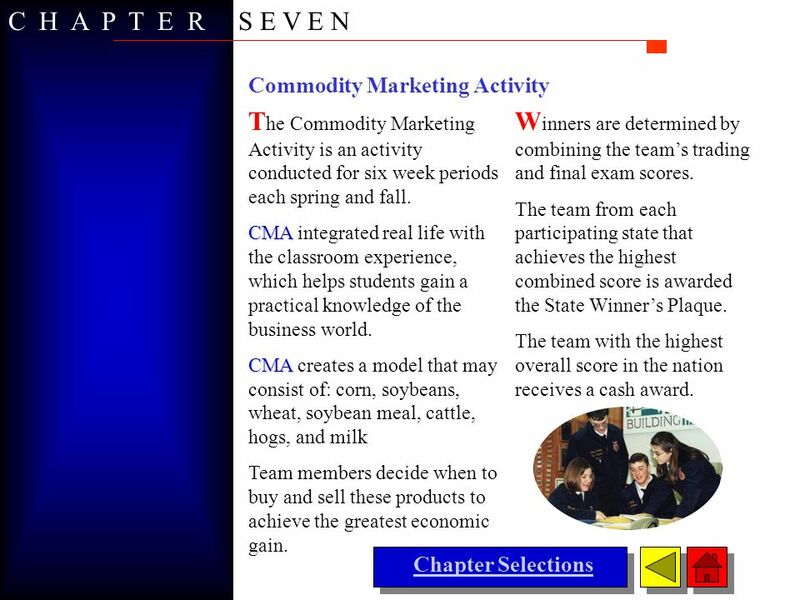 Describe a Supervised Agricultural Experience (SAE); B. List and differentiate 5 types of SAE’s; C. Explore SAE. Introduction to SAE. Objective 6.01 Apply employability skills in work-based learning and career planning activities in order to understand the needs.